I usually commence at your hotel or B&B in Bayeux (or nearby) at 8.30am or 9.00am as you prefer and we will return around 5.30/6.00pm. In the morning we will concentrate on the Sword beach sector, the most heavily defended area of the Overlord Operation because of its links to the logistical and industrial hub of Caen, a city which is as important to the Germans as it is to the Allies. The most audacious raid of Operation Overlord. Part of the mission for the 6th Airborne Division on the night of June 5/6th was the capture of 2 bridges over the crucial waterways, the Benouville bridge (later called Pegasus) on the Caen canal and half a mile to the East the Orne River bridge near the village of Ranville. The Coup de main is to be carried out by Major Howard and 180 men of the Ox & Bucks regiment. 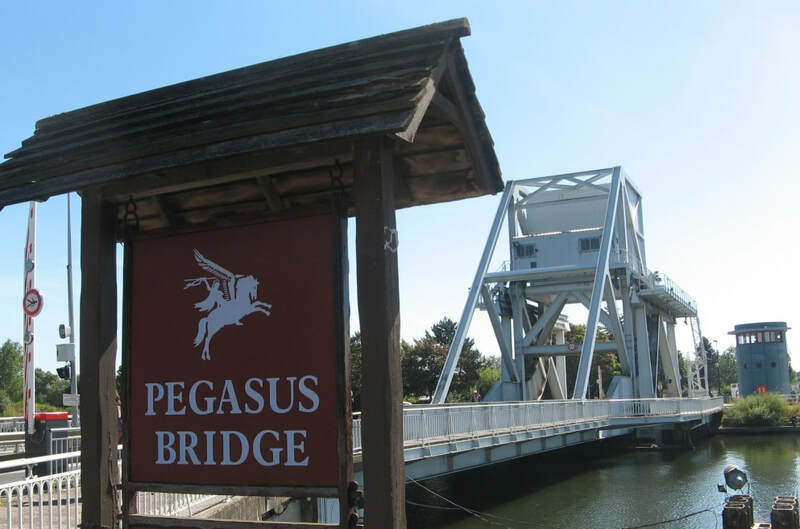 Their objective was to land in 6 horsa gliders shortly after midnight and capture intact those two bridges to prevent any German counter attacks from reaching "Sword beach" 6 miles to the North, where the 3rd Division of the British Army was due to land at 7.30 on the morning of June 6th. They were to hold these bridges until relieved - which is one of the most famous scenes in the movie - THE LONGEST DAY (filmed on location in Normandy in 1961). Less than a mile from Pegasus bridge is Ranville one of 18 Commonwealth War Cemeteries in Normandy and the first village liberated in France. The cemetery is the final resting place for 2564 soldiers, many of them belonging to the airborne forces who lost their lives in the first days of Operation Overlord and were buried by local people. A German Observation post controlling the co-ordinates for the German guns within the sword beach sector and the incredible story of its' liberation and the capture of 50 German prisoners by 3 British soldiers. This concrete structure over several floors is one of the best preserved German positions in France. The site of the first British landing on sword Beach by the East Yorkshire and South Lancashire Regiments. History was surely made here!